Wow I am in a national magazine! 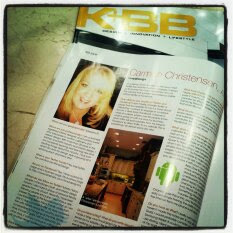 Be sure to check out the September Issue of K+BB Magazine! You can also check it out at K+BB Online, Kitchen And Bath Business Magazine. This truly has come about through the power of Social Media and wow! I am thrilled to have been given a moment to tell a bit of my story share how Twitter and Facebook are affecting me and my business. this is super Carmen congrats! Thanks so much JB! Such a thrill for me to be part of K+BB...wow! Congratulations on the article! It was great to learn a little more about you and discover your little corner on the web. Love your work. When you hike the AP stop in and tell us all about it. Hey Steve, thank you so much, I am happy and excited to share my little corner on the web and glad you enjoyed. When I get out to the AT, I will be sure to stop by and share my adventures! Does your Kitchen have a Wine Cellar?